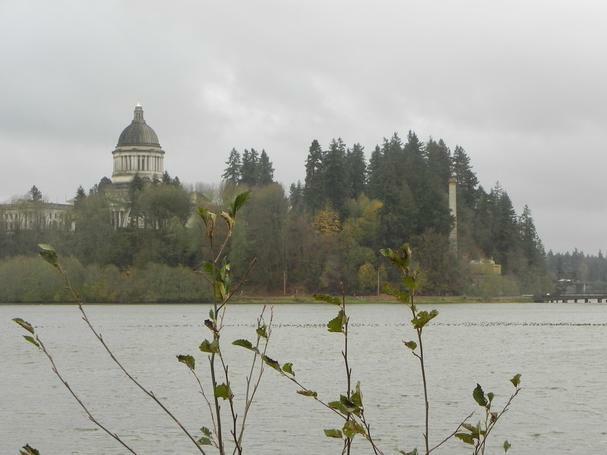 Olympia, Washington State's capital, has many claims to uniqueness: It’s the water! Olympia - the center of intelligence! Where things move at a glacier pace! It’s the water! Old timers will remember the Olympia Beer company slogan from when the beer was brewed in nearby Tumwater, Washington. This small community is about an hour drive from Seattle and adjacent to the capitol, Olympia. The famous water used for the beer was “artesian water” which is simply well water. 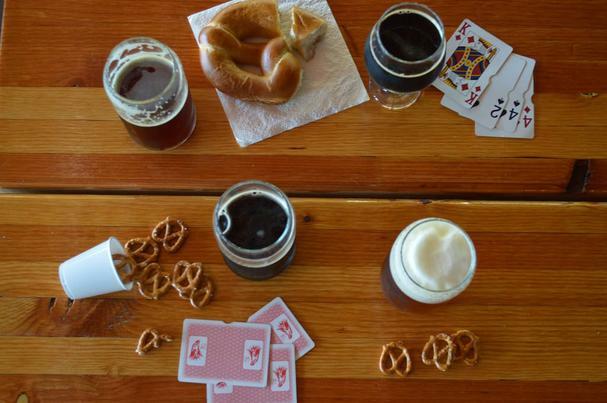 Olympia Beer stopped production in Tumwater in 2003, but artisans of many kinds remain. 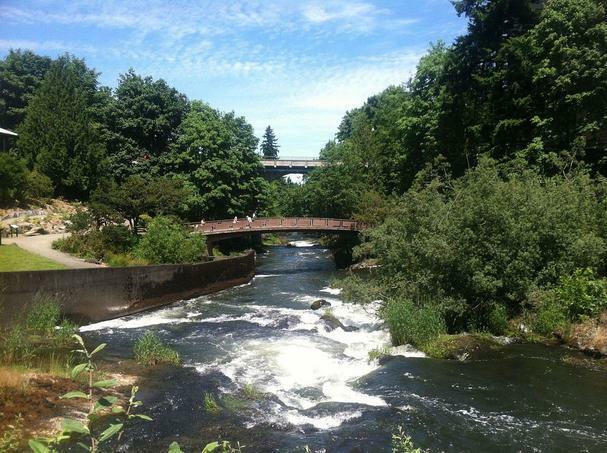 Our first stop was to enjoy the flow of Deschutes River at Tumwater Falls Park. Deschutes is a French word meaning “of the falls” and the First Nations name of Tumwater is “waterfall”. Very fitting! The Deschutes River continues several miles to the south and forms Capitol Lake, thanks to a dam. This river runs for a total 50 miles and should not be confused with the much bigger river of the same name that is in Central Oregon . Tumwater is the oldest permanent settlement in the Puget Sound. When it formed in 1845, it was first called New Market. One of the big draws was the easy access to salt water for navigation and eventually a power plant was built. However, many beer enthusiasts think that 1896 is a more significant date, which was when the Olympia Brewing Company (Olympia Beer) opened here. In fact, the old structure is still in place and there are ongoing discussions to restore the red brick Old Brewhouse. After this refreshing walk we drove along the Deschutes River and then past Capitol Lake to take in the stunning view of the state capitol. We mentioned that this lake is dammed and there are plans to remove the damn, which was built in 1951. If removed, this area would return to an estuary and the water would freely flow again into Budd Inlet of the Puget Sound. Several experts that we talked to suggested this political process will move at a glacier pace. I think some will like this slow process. This political discussion was making us thirsty so within a few minutes we arrived at Three Magnets Brewing Co. We first walked through the adjacent café, Darby’s Café and the smell of French fries made us hungry. As we walked through Darby’s, my wife mentioned that Darby’s was featured on the Food Network “Diner, Drive-Ins’, and Dives, Hometown Haunts.” This is certainly a diner with lots of folks hanging out and enjoying the food. The scene at the brew pub was similar. Both places are owned by Nathan and his wife Sara Reilly. They left their jobs in Olympia in 2005 to purchase this restaurant and started the brewery several years ago. The name of Three Magnets is taken from work published by Ebenezer Howard in 1898. Howard discusses taking the best aspects of both town and country living and combines them to coin a new term, “town-country”. Howard’s thesis is that such a situation would attract people to a near utopian living experience. 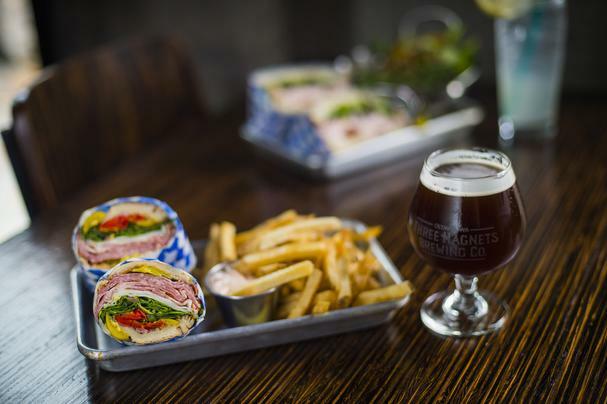 While that may be a bit idealistic – in the meantime, Three Magnets Brewing Co is a great place for at least temporary utopia. Sara rolled out the beer samples. I sampled the lighter style and fell in love with their Little Juice- Smoothie Edition, which is an IPA style with a little wheat. This is also the favorite of Sara and Jeff, the head brewer. My wife likes the hardy ones, so she enjoyed the Wreathing Havoc which uses a rye malt base and balances it with European dark and amber malts. Perfect winter beer. One of the surprises is I really liked the Imperial Brown Ale; usually I stay away from the darker beers. However I may have converted today. This beer had great balance with a hint of nutty and toasty malt. Then, those French fries arrived and they tasted just as good when hot as when they cooled off, which we have found to be rare in a French fry. Very pleasant surprise. Having finished round one of beer tasting, it was time to take the ten minute drive south to Lacey, our next tasting. On the way, my wife pointed out the new distillery in town and several wineries, but I told her the theme is beer today and so we rolled into Top Rung Brewery. This family-friendly establishment is the brainchild of two firefighters who originally met at Black Lake Fire Department, Jason and Casey. The fire department vibe is all around. with a statue of a Dalmatian at the door and beer holders that resemble ladder rungs. The seating is at large picnic tables, and while we were there, we saw several families coming in with their own picnics. Which will of course be augmented with the wonderful beer on tap. House brewed root beer for the kiddos! 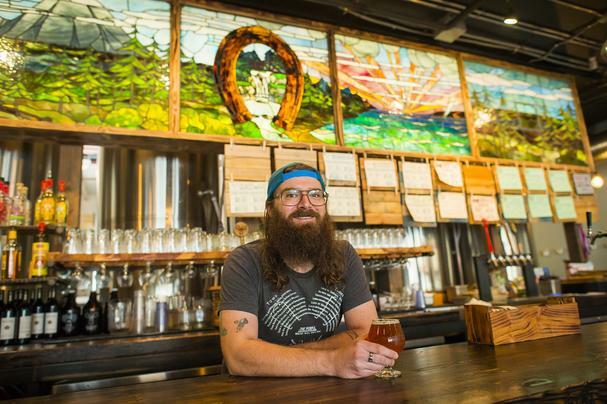 Casey’s affinity for breweries goes back to his childhood when his family used to take relatives for the tour in Tumwater of Olympia Brewing Company. After the tour, the adults would enjoy a beer and Casey consumed LOTS of sodas. In fact, Casey’s neighbor was the brew master there and perhaps showed Casey some tricks of the trade. It was time to sample Jason’s best (chief of brewing operations) and I certainly liked the Lacey Logger with a perfect clean and crisp taste. However, the winner for me was the Harvest Lager which has a small hint of sweetness and some great body. This is considered a Marzen style beer, which in German means March. This is brewed in March and generally served at Oktoberfest. My wife, as usual, was in charge of the hearty beers and had two favorites. She enjoyed the Shift Trade IPA which had a light fruit taste but was certainly full bodied. She equally enjoyed the El Dorado Wet Hop Pale Ale. Casey made the point that he is interested in sustainability and environmentally friendly practices. To this end, the pigs at the local farm, The Farmstead, are the winners as they get the spent grains for some gourmet meals. Funny, on the way out we saw the food truck; The Flying Pig BBQ, but we did not inquire about the source of their pork. The lovely aroma coming from the food truck reminded us that it was dinner time, so we drove to West Olympia to the Iron Rabbit. We started with a delicious appetizer of Lamb Kofta. This soft and spicy meatball with paprika and cumin and their homemade tzatziki sauce was wonderful. We were tempted to pair that with their homemade root beer but went with some Riesling which was perfect . For the main course we didn’t see any rabbit on the menu so my wife went with the lighter fare of Hopp Salad, which had a healthy dose of grilled chicken, artichoke hearts, and cherry tomatoes with spring greens. I went with the Prawn Bacon Linguini in a light white wine and garlic butter , spiced with chili pepper and cumin. Heavenly! Last selection of the day was dessert. My wife ordered the bread pudding, which she had noticed upon her arrival as the folks at the table next to us were enjoying it. As a bread pudding aficionada, my wife said this one was definitely on the A-list. For our second day, our first task was to solve the mystery of the mounds. 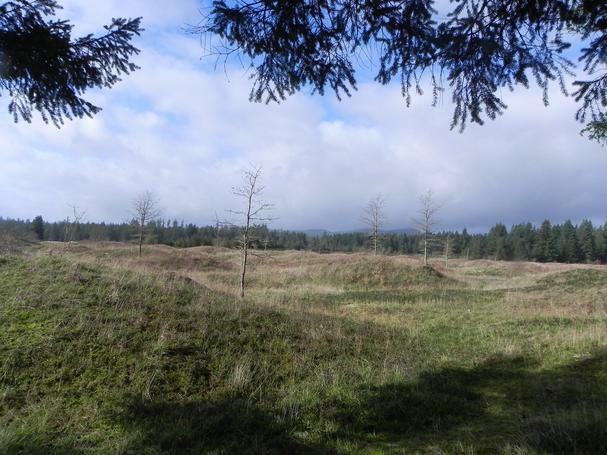 Thus, we took the 30 minute drive to the 600 acre Mima Mounds Natural Area Preserve. The mounds are in various sizes, from as small as one foot tall to perhaps up to seven feet. And we are not talking just a few mounds. There are thousands in the area! During our three mile hike we discussed some of the theories of how these mounds formed. Theories range from an Indian burial site, or perhaps nuclear testing done by Hanford Nuclear Site, or perhaps an asteroid storm that stuck here, or prehistoric giant slugs. These are just some of the more fanciful theories and they have all been mostly dismissed by the experts. One serious theory is that they were formed by pocket gophers burrowing and building extensive tunnels systems. But some scientists have dismissed this since there are big rocks found in mounds that would be too big for gophers to move. The most popular theory is that during the last ice age (14,000 years ago), a glacier, and the terminus was near the present-day site of Olympia, scoured out the Puget Sound. Then, when temperatures warmed up, the glacier melted and the water carried gravel and soil which formed the mounds when deposited in scoured out depressions (sun cups). My wife prefers the giant slug theory. With the hiking completed and the mystery somewhat solved, we headed back to Olympia for a special feast at the new Market 222. Market 222 is a brand-new open market place/food hall adjacent to downtown Olympia, featuring a variety of independent and artisanal food and beverage producers from the Pacific Northwest. According to the website, it has been described as “European Market meets Hip Olympia Funk”. And we think that description is perfect. We were greeted by Andre Le Rest, owner of the well-established Bread Peddler. Andre became a baker in his early days in the US at Port Townsend. Apparently, he did not like the bread available and decided to learn the trade. He certainly learned it well. Andre actually owns and operates three separate entities: The Bread Peddler, The Bread Peddler Crepe, and the Peddler Bistro. We highly recommend any and all! We enjoyed breakfast at his brand-new place in the market; The Bread Peddler Crepe. Andre’s crepes utilize the classic method that dates back to the 12th century from the Brittany region in France. Andre was raised on a farm in Pouldreuzic in Brittany where he learned about farming and crepe making. Buckwheat is the classic crepe and is healthy and tasty. It is interesting that the more well-known white crepes were introduced many years later. I immediately fell in love with the lox and chevre crepe. Everything was fresh and very tasty, but we were told to slow down, as there is much more to sample. The chicken crepe was next, mixing spices of rosemary and garlic with a creamy mushroom duxelle sauce. Yum! To help enjoy the crepes we were given a special beverage, Cidre Bouche from Domaine du Verger, also from Andre’s native Brittany. The light fruit taste was a refreshing late morning treat. I can see why their cider received a gold medal. Andre finally rolled out some of his sweet crepes: with choices of strawberry, or banana with chocolate hazelnut, or lemon butter or strawberry. The airy dessert crepes were a great way to finish off breakfast. Andre wanted to show us his bistro but it was time for a break. 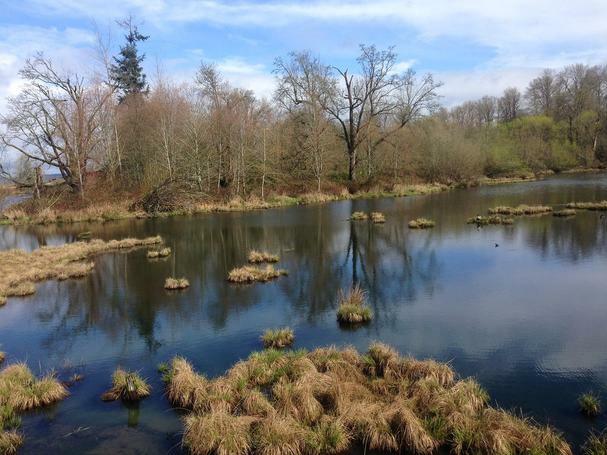 For our break, we took the short drive to the south to the Billy Frank Jr. Nisqually Wildlife Estuary. The estuary forms from the meltwater of the Nisqually Glacier on Mt. Rainier that flows some 60 miles into the Puget Sound. This estuary is home to 200 species of birds. The first part of our 3+ mile hike was to the Twin Barn Trail that goes past two white barns dating back to the early 1900’s when it was Brown Farm. We continued hiking on the boardwalk, enjoying the clouds rolling in and out, the sounds of the ducks and the intermittent splash of jumping fish. This area was heavily diked for farming in the 1900’s which of course greatly changed the ecosystems. However, a restoration project beginning in 2008 expanded the estuary by 50% and restored the riparian forest. Also, some of the Olympia Oyster beds (along with other species) were restored. 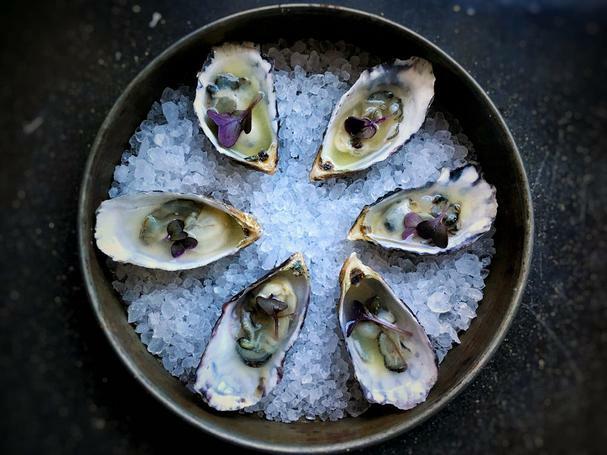 The talk of oysters reminded us that fresh oysters were waiting for us at Chelsea Farms Oyster Bar at 222 Market. Their oysters are farmed in Eld Inlet which is northwest of here. We quickly made it to the Oyster Bar and were greeted by Shina who, along with her brother Kyle, manage the farm. Shina is quick to acknowledge her parents’ (John and Linda) key role in developing these Chelsea Gems in 1987. Although Shina and her brother did some of the work as kids in the early days, their parents, especially mom Linda did the heavy lifting. Oyster shells tend to grow next to each other and in the “old days” Linda use to take the 50 pound bag that the oysters grew in and shake time. However, her husband John did some research and developed a system which uses the tides’ energy to tumble the oysters in the bag. Other companies use a mechanical process but Chelsea does it naturally. Their oysters are now served coast to coast in famous US restaurants and we sure enjoyed today’s samples. First was the Infused Gin Cucumber Rambo Radish with a mellow taste. Then we had Chelsea Gems House Kimchi Brine, with just a soft kick from the kimchi. 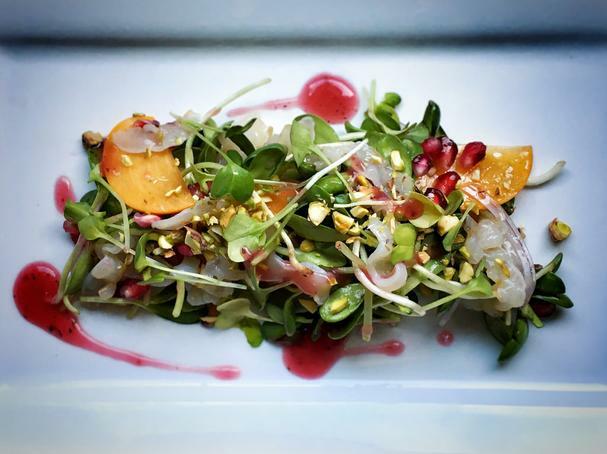 As a bonus we had Geoduck Salad with sunflowers, sprouts and peas. This was light and tangy and paired very nicely with Champagne! We thanked Chef Austin for this wonderful combination and moved on to our next culinary experience. We were ready for some more dining with Andre and his partner Frances to their restaurant that is this adjacent to 222 Market, The Peddler Bistro serving traditional French food. They have developed the prefect ambience with photos of Andre’s grandparents and dad, along with neighbors from Andre’s childhood home in Brittany adorning the walls. Walking into the richly wooded décor, with a beautiful hand crafted (by Andre) bar, felt like entering into a time warp, to another world and era. I was going to order a turkey sandwich but Frances looked (sternly and politely) at me and said you “must try” our Lyonnaise Salad. This classic French salad is a unique and tasty combination of frisee (a curly salad green), crispy bacon slices, fried potatoes, thyme and a poached egg. This was perfect! My wife loved the Mussels Bretonne, steamed to perfection in cider, crème and seasoned with chives. They invited us to try their desserts, which was sorely tempting, but we were headed so Sofie’s Scoops. We met Sophia and her partner Christopher, who both have lots of experience in the food industry and have created a truly craft gelato. Everything is fresh and made on site using locally sourced milk. My wife was very excited to learn that gelato is actually easier on the diet than ice cream. Using milk instead of cream, the fat and calorie counts are lower. The creamy, luxuriant taste of gelato is created by the slow careful churning. 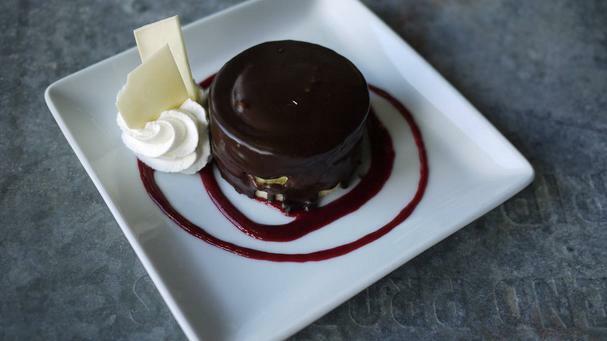 Sophie offers the “standard” flavors, but specializes in some very creative innovations. We really enjoyed Oly Fog with black rose tea and sweet vanilla base. Specialty flavors rotated daily. 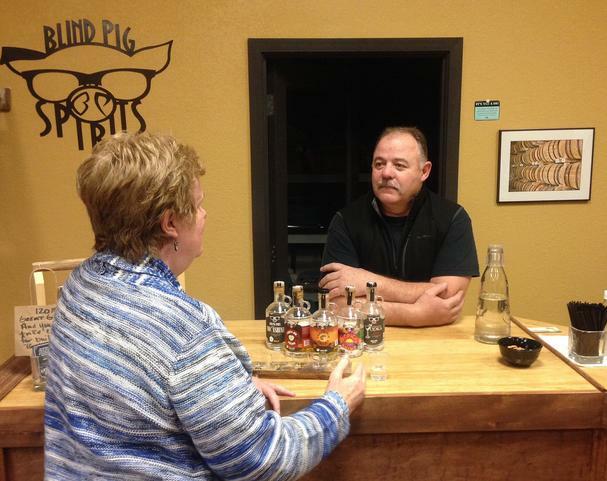 There was one last stop for the day, Blind Pig Spirits. We were curious about the blind pig part and Ray, one of the owners assured us that this is a pig-free zone. Ray poured many of his finest samples and starting to elaborate on the distillery history. Before the story started I have to confess that I’m usually not big on spirits. However, that was changed today by the slightly sweet and refreshing Peach Pie Shine. It was good to the list drop so we took some home to enjoy later. Blind pig, blind tiger, and speakeasy were all names of illicit establishments that served alcohol beverages in the prohibition era. However, blind pig referred to a “lower class” establishment in which patrons were there to see an attraction (like a pig) and on the side given a nice stiff drink. Speakeasies are considered “high class” as quite often coats and ties were required. Blind tiger is like a speakeasy, but also included gambling. I think these establishments, exiting as they were, probably missed out on the high quality of spirits served at Olympia’s Blind Pig. We bid farewell to Ray as time ran out on our visit and we thanked our touring hostess for the day, Lela Cross. 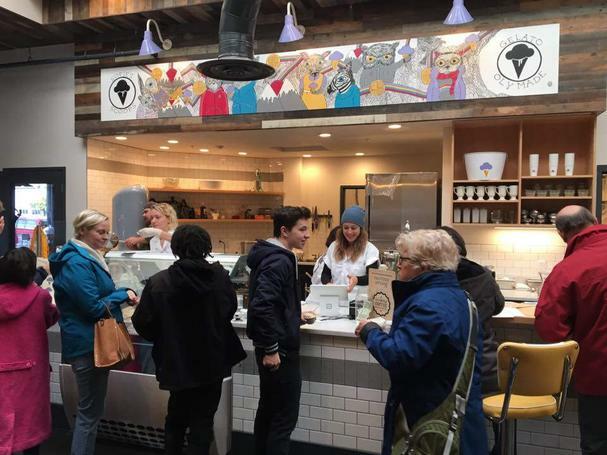 Lela along with Gray and Joy Graham are the proud owners and masterminds of this market that includes all the artisan food offerings along with other retailers. We spent a good part of the day here, and could have easily stayed longer. The owners picked a perfect location close to downtown and a 16-minute walk from the capitol campus. After the feast at Market 222, we took a one minute walk to the waterfront, Percival Landing Park and enjoyed the stroll. We know that with the slightly-over-an-hour drive from Seattle we will return often.